Missha HGR01 is one of my favourite duochromes, even if I don't really like green. This polish is cool toned green to blue, with hints of gold. This polish hits close to home, since it reminds me of my favourite insect - the green beetle (Cetonia Aurata). It's a two-coater and smells like roses! The topcoat diminishes the smell or it goes away after a day or so, but I find it super nice and girly. Formula is great. Not thick but still opaque, its extremely finely milled metallic shimmer is beautiful. It does not show streaks and doesn't chip very easily. The brush is HUGE but it helps cover the entire nail, which is useful for longer nails. The big cap is a little hard to hold but I didn't mind too much. HGR01 is somewhat similar to Chanel Peridot, but it's more green-blue as opposed to green-yellow duochrome Peridot has. Absolutely beautiful color, it's even better in person...My most favourite green! zomgz this looks like one of the ozotic duochrome polishes!!!! it still in my untried...that's a bit crazy because it looks so beautiful in the bottle and on your nails! 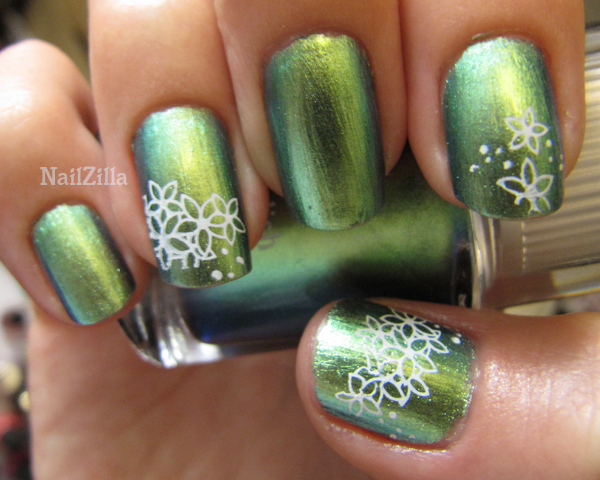 @Nailderella it's a green I LOVE and I usually dislike greens! I wonder how it will look with a holographic top coat. if you like this you should try some tony moly or face shop nps.